Chatsworth, GA — The USDA Forest Service recently announced the grand opening of the 26-mile Dry Creek Trail System on the Chattahoochee National Forest in northwest Georgia. After several years of planning, new trails were built from the ground up to create a safer, more maintainable, and ecologically sustainable trail system from an unplanned network of older trails that did not meet current trail standards. Over $448,000 in American Recovery and Reinvestment Act (Recovery Act) funds made a project of the size possible, providing a safer and more satisfying experience for horseback riders, hikers, and mountain bikers. According to Chattahoochee-Oconee Forest Supervisor George Bain, “the success of this large trails project would not have been possible were it not for this funding and the involvement of our partners, the Back Country Horsemen of America and others. This partnership is a perfect example of the collaboration the forest is striving for in the management its trails program”. Five miles of old trail were closed and rehabilitated and 26 miles of new trail were surveyed, planned, and constructed. Five years ago, Larry Wheat, President of the North West Georgia chapter of the BCHA, had the inspiration to design and push forward the development of a new 26 mile Dry Creek trail system. Larry spent hundreds upon hundreds of hours laying out, designing and working with the FS to construct a system that met or exceeded new trail construction requirements. Larry, with his calm demeanor and in-depth knowledge championed this trail system to success and over the hurdles that such projects encounter. The public was invited to a grand opening celebration on June 25, 2011. Festivities began at the Dry Creek Trailhead at 11AM. Refreshments were served and free, guided trail rides were offered. The Dry Creek Trail System and the connecting Pinhoti Trail are easy to moderate trails open to hiking, horseback riding, and mountain biking. The large trailhead parking area accommodates horse trailers as well as passenger cars. Back Country Horsemen of America is a volunteer service organization dedicated to: perpetuating the common sense use and enjoyment of horses in America’s back country and wilderness; working to insure that public lands remain open to recreational stock use; assisting the various government and private agencies in their maintenance and management of said resource; educating, encouraging and soliciting active participation in the wise use of the back country resource by horsemen and the general public commensurate with our heritage; and fostering and encouraging the formation of new state Back Country Horsemen organizations. In consideration of the newly scheduled dates for our 2011 events, participants that have already signed up on the original applications are required to submit a completed Addendum for their respective event. Starting June 1, 2011 only the revised applications of the 2011 Tevis Ride will be considered. An Addendum will be emailed to anyone that has supplied a valid email address to the office, or by mailing address otherwise. Your help in expediting this matter is greatly appreciated. Anyone with questions is encouraged to phone or email the office. Because our office hours are limited at this time, emails will generally receive a response the same day while phone calls may take up to a week. This year's educational ride weekend was rescheduled to July 15th-17th and was a great time. There were 43 total participants, all of whom were able to become familiar with the trail and learn about important topics such as shoe padding, equine massage, horseshoeing, saddle fitting and more. Loomis Basin Veterinary Hospital was also there performing an ulcer study providing further awareness regarding ulcers and preventative measures. The weekend was an educational experience for everyone involved; with the help of 30 guide riders and numerous other volunteers. A big THANK YOU goes out to all of the sponsors who helped make this weekend possible: Somewhere Over the Rainbow Lodge, Platinum Performance, Inc., EasyCare, Inc., Delta Mustad Hoofcare Center, Echo Valley Ranch, Inc., LMF Horse Feeds, Vettec Hoof Care Products, Ariat International, Foresthill Divide Chamber of Commerce, Foresthill Joe's Coffee House, Subway-Foresthill, Chefs Orlando Sanchez, Red Dirt Saloon, Worton's Market, Triple Crown Nutrition, Inc., and Sypolt Insurance Services, Inc.
To see the weekend's results please click here. The Appaloosa Horse Club, which acts as the international breed registry, pulled into West Yellowstone on Aug. 5 as the final stop on their annual Chief Joseph Trail Ride. The annual ride honors The Nez Perce Indians and the Appaloosas that they rode and bred. Black, brown and white Appaloosas, some speckled and some with solid blocks of colored markings, trekked across a 100-mile segment of the Nez Perce National Historic Trail with 125 riders on horseback. More than 200 members of the club joined the group this year as they covered another leg of the historic trail, beginning at their assembly camp in Spencer, Idaho. The trip is the biggest trail ride the club has each year. The Nez Perce National Historic Trail begins in Joseph, Ore., near Wallowa Lake and extends more than 1,000 miles, ending at the Bear Paw Battlefield in Chinook, Mont. A brief downpour of rain cooled horseback riders as they proceeded to finish the first loop of the Buckskin Challenge Saturday morning. Event coordinator Kara Yost said the weather was ideal for horses involved in the 25-mile or 50-mile endurance races west of Pocatello that started in Buckskin Canyon. Participants came from Idaho, Utah, Wyoming, Montana and Oregon. Yost said 20 people competed in the 50-mile event and about 20 competed in the 25-mile event. After losing her horse, Firth’s Peggy Taysom abstained from endurance riding for several years. This year she participated in the 25-mile event with her gelding, Maynard. This was her third endurance race. The 2011 mosquito-borne disease season continues to affect horse owners across the country. The most recent reports indicate Hthat a horse in California and a horse in Nevada have both tested positive for West Nile virus (WNV). In 2010, the USDA's National Animal Health Surveillance System reported 125 confirmed cases of WNV in 28 states. According to the California West Nile Virus Website (produced by the California Department of Public Health, the University of California Davis Center for Vectorborne Diseases, the California Department of Food and Agriculture, and the Mosquito and Vector Control Association of California), a horse in Los Angeles county recently became the first horse in the state to be confirmed WNV-positive in 2011. Boise, ID – After a near 2000-mile horseback ride on the Pony Express Trail, Idaho resident Tom Noll is back home. It took eight weeks for Noll and his two horses to cross prairie, mountains, and desert in eight states. Back in May, he said the trip took more than a year’s worth of planning. I sat down with Noll to talk about his journey. Like in most races I enter, I had no designs on winning Saturday's Fireworks 50-mile endurance ride. Unlike the rest, I actually had a chance this time. The route for the 38th running of this marathon horse race wound through trails in Henry Cowell State Park, the Pogonip, UC Santa Cruz and Wilder Ranch State Park, giving me the home field advantage. 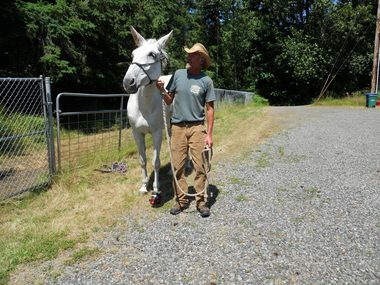 Furthermore, my steed -- an Arabian-mustang cross named Courage, who was loaned to me for the ride by my friend Steve Shaw -- was in excellent shape, thanks mainly to the conditioning he got while competing in ride-and-tie races all summer. Most pertinent to our chances at winning, however, was that, unlike me, Courage actually possesses endurance, heart and speed -- qualities I have discovered to be universally held by athletes who win races. But we weren't going to win. Steve had made that very clear. If I wanted to continue to ride Courage after this race, I needed to stay in Steve's good graces, and he had warned me that he didn't want me going out and trying to win my very first 50-mile endurance race. But, then again, he didn't want me to soil the horse's reputation in the endurance world by taking last either. So, in the first race I could actually win, we agreed I was instead going to aim for 10th. As Texas residents battle extreme drought conditions, horse owners are struggling to get their hands on enough hay to feed their animals. "The drought is quite widespread and covers nearly the entire state," said Dennis H. Sigler, PhD, a professor in the department of animal science at Texas A&M University (TAMU) and the TAMU Extension Horse Specialist. "Although some areas are much worse than others, all but just a couple of counties out of 254 are under a severe drought, with little relief in sight." Added Travis Miller, professor and associated head of the Department of Soil and Crop Sciences at TAMU and Extension Program Leader, "We are experiencing the most severe one-year drought in Texas history. June 2011 was the warmest June and the fifth warmest month is our history of recorded weather. July 2011 set the record for the warmest month in recorded Texas history. While we made some good hay in 2010, our hay barns were empty from a very severe drought in 2009. We have been feeding livestock since October, and 2010 hays supplies are gone." Last summer, when Sophia Mangalee read a story on Equidaily.com about the winner of the 2010 Mongol Derby, she was more than intrigued and entertained. She was inspired. Mangalee’s aspirations are coming to fruition sooner than she thought. After being accepted as one of the 26 entrants and one of only three Americans in the race, Mangalee began a year-long preparation for the biggest adventure of her life. What is a dream vacation for endurance racing veteran Carol Wadey and her family? Traveling with three horses over 5,000 miles in three weeks to race together on 250 miles of some of the most spectacular trails in Canada and the United States. Sticking closer to home, but enjoying equally beautiful scenery and camaraderie, Mavis Holroyd and her 14-year-old son, Scott, have ridden as a team for the past seven years and have formed an unbreakable bond while racing over 1,000 miles of Alberta’s endurance trails. Between them, these two families have raced over 4,000 miles, regionally, nationally and internationally, and it has been mostly just for fun. Endurance racing is one of the world’s fastest growing equestrian sports, and with all it has to offer, there is little doubt why. It is an ‘anybody’ sport – there are no age limits, no breed restrictions, no dress code (except for approved helmets for juniors), and no special tack is required. It is becoming very popular as a family sport. It is challenging and exciting, but serious accidents are rare, trails are usually well marked and easy to follow, and it is one of the only equestrian sports that is strictly monitored by veterinarians – the horse’s well-being comes first at all times. Riders of all ages learn excellent horsemanship skills, teamwork, and sportsmanship as they test themselves and their tough mounts against 25, 50, and even 100 miles of rugged trail. Surprisingly, even the youngest of riders quickly become hooked on this challenging sport, making it a perfect family affair. SANTA CRUZ -- The first time Ruth-Diane Trefethen rode in the Fireworks 25 & 50 Endurance Ride, a long-distance equestrian event, in 1985, she was too tired to enjoy the music of the live band playing after the race. But after winning the 28th running of the race on Saturday, the 69-year-old from Mariposa said she would dance to the sounds of "Bluegrass By Default" -- the very same band that played after her first race some 26 years ago. Trefethen didn't show any signs of fatigue after this race, though it came nearly three decades and one knee replacement after her first one. "Tired is in the mind," she said after her victory with a purebred Arabian nicknamed Peekaboo. While the more skilled or competitive participants rode the 50-mile course, those who wanted to train their horses for longer runs or were simply looking for a long, relaxing trot took part in the recreational 25-mile course. Riders who finished in the middle or end of the 50-mile pack received awards, while all 25-mile riders left with prizes for themselves and their horses. "It's pretty inclusive so that every rider has a chance to do well," said Debbie Boscoe, an organizer for the event. "It's not just how fast you go." On April 3, 1860, the first Pony Express rider left St. Joseph, Mo., with the U.S. mail in his saddle pack, heading for California. A hundred and fifty-one years later, on May 24, 2011, Max Merlich of Sandy, along with 35 other riders, left St. Joseph to re-enact that maiden ride and pay homage to those hardy pioneers. "I've been asked why I would take on such a trip," Merlich said on his return to Sandy two months later. "I can only say it was the experience of a lifetime." The 21st-century riders covered 250 miles each week as they rode through Missouri, Kansas, Nebraska, Colorado, Wyoming, Utah and Nevada. California was the final stop on the original Pony Express route, but the state denied permits for the modern ride because the route went through wilderness terrain. "We traveled along the original route through plains, deserts and over mountains as much as possible," Merlich said, "and stopped at the few Pony Express stations still standing." Time and civilization have obliterated much of the trail and stations. Euston, England- U.S. endurance rider Heather Reynolds stepped up and took the win at the 100-km Endurance Test Event Pre-Ride for the 2012 World Endurance Championship in Eustone Park, England, on July 24, 2011. Reynolds guided Opium Lord in the FEI CEI2* to cross the finish line in a time of 5 hours: 26 minutes: 03 seconds, averaging 22.45 km/hr. She was followed only eight seconds later by the United Arab Emirates Khalifa Ghanem Al Marri riding Taita. Team USA's Cheryl Van Deusen finished in 20th place aboard Dacora in a time of 8 hours: 23 minutes: 37 seconds. Thirty-eight riders started, 21 finished and 17 were eliminated during the ride. In the 160-km race, Team USA's Becky Hart crossed the finish line in 13th place aboard Oued El Kebir Larzac, averaging 18.33 km/hr on a time of 8 hours: 43 minutes: 57 seconds. For more information, visit http://eustonparkendurance.co.uk/default.aspx, or http://www.cso-scores.net/ for additional results. invasive weeds on public lands,” said BLM Idaho State Director Steve Ellis. “It’s consistent with existing policies of the State of Idaho and the U.S. Noxious and invasive weeds are a serious problem in the American West. allowed for use on public lands in Idaho. Rosentreter, (208) 373-3824 or Roger_Rosentreter@blm.gov . Four Canadian endurance riders have completed a race in China as part of a trade mission to Zhaosu County in the country's northwest. The four were part of a group of six individuals representing Equine Canada's Export Market Development program (EC Export) whose objective was to experience firsthand, a Chinese-run equestrian sporting event, gain knowledge of China's current horse husbandry practices and demonstrate that Canada has the expertise to partner with China as it strives to develop a contemporary horse industry. The event was run in Zhaosu County, in the Xinjiang Uyghur Autonomous Region of northwest China. Lexington, KY - For first time in the event's history, the Adequan/FEI North American Junior & Young Rider Championships presented by Gotham North played host to the North American Young Rider Endurance Championship. The competition included both CEI2* and CEI4* divisions which were completed yesterday, and team medals were presented today in both divisions. In the CEI4* divisions, Team USA took home the Gold medal after accruing a collective ride time of 25 hours, 25 minutes, and 31 seconds. The team was made up of Lindsay Bean and Tektonic, Devan Horn and DJB Sameill, Kyle Gibbon and Missu Koran, and Kelsey Russell and My Wild Irish Gold, who successfully negotiated the 75-mile track despite the intense heat and humidity of the Kentucky summer. Individually in the CEI4*, Russell took home the Gold, Bean the Silver, and Gibbon the Bronze. horse pace themselves because they're good at knowing how fast they can go. "They were really nice trails, really well marked," she said, adding that although the grass was "a little slippery," she used a combination of Renegade boots and mud nails to gain traction. Russell was able to preserve "Irish" well throughout the course and by the end, the horse still had enough steam to give Russell a memorable finish: "We trotted all the way until the last turn and then cantered around the last turn. There were horses behind us, and the horses just wanted to race, so we let them." Bean, who hails from Maine, said the terrain at the Kentucky Horse Park was different than the mountainous ones she's used to riding on at home, but due to warm summer weather, she was glad for the change: "It was really hot, so the harder terrain would have made it difficult." She also explained that leading up to the 75-mile ride, she used other competitive rides to prepare, as well as lots of walking and hill work in warm temperatures to build up Tektonic's endurance. The rolling hills of Kentucky were also a change of scenery for Vermont-resident Gibbon, but he enjoyed his ride through the Bluegrass. "It was a really pretty course...nice scenery," he said. "[The track] was really well marked; there was no way to make a wrong turn. That gives you a lot of confidence for the course." Gibbon said in preparation for the NAJYRC, he and Missu Koran have been competing on a regular basis and did a few 100-mile rides, but interspersed adequate rest and some interval training for a rounding training program. Also in the CEI4* division, Tektonic received the Best Conditioned Horse Award, which was decided earlier this morning. In the CEI2* class, the Team Gold medal was awarded to Team USA Northeast A, whose collective ride time totaled 25 hours, 40 minutes, and 57 seconds. Team members included Bean and Tektonic, Gibbon and Missu Koran, Forest Green and LR Amana Tabi, and Steven Hay and Khalil Asam. "[The track] was easy to follow," Hay said. "The heat was a big deal. It required smart riding." Capps said that the heat influenced how the competitors cooled their horses out after each loop, and also the pace at which the ride was completed. "We did lots of electrolyting and lots of ice water," she explained. "People took it slow. Usually we have faster times but we had a lot of people go slow." Unfortunately for Capps, the heat was too much to handle: "The ride was too hard for me and the horse, but the one loop was nice. It was out in the sun and you just get pounded with heat all day long." Conversely, Roberts said that her horse handled the heat well and that she enjoyed riding the well-marked trails. Finally, Clark said she used a heart monitor during the ride to keep close tabs on her horse's heart rate. She also said, like many other competitors in the ride, she used a cell phone to keep in touch with her crew during her ride. "I used a Bluetooth headset," she explained, adding that her crew called regularly "to check in, see how the horse is doing, and know what they have to have ready" for when she arrived from a loop. She also said she kept in touch with the team veterinarian throughout the ride and updated them on Al Capone's condition. "That helped a lot," she said. Individually in the CEI2*, the Gold medal was awarded to Sophia Bashir from Team USA Central and Dazed and Amazed, the Silver was presented to Roberts, and the Bronze to Hay. Bashir, a Texas native, travelled to Virginia to train with Dazed and Amazed with lots of "fast walking in mountains and hills and intervals." Additionally, she was pleased with how her horse handled the heat. "He handled the heat well," she said. "The first loop was better because it was cooler. We started slowing down throughout the day. I tried to keep a consistent pace and that seemed to help us out." Bashir added that this competition was her first 75-mile ride, and that while she isn't sure what she'll do next, she'd like to continue and try a 100-mile ride. Sir Valient, who represented Colombia in partnership with Camilo Andres-Villa, received the Best Conditioned Horse Award in the CEI2* division.